If you interact with the Files app frequently in iOS, you might be pleased to discover that the Files app offers a quick and easy way to see recent files, right from the Home screen of iPhone or iPad. Even better, you can launch recent documents directly from this quick Files access feature in iOS. The recent files trick works on all modern iOS devices, but it’s slightly different with the iPad and non-3D Touch iPhone than from 3D Touch iPhone models. If you want to get out of the Recent Items view of the Files app, just tap away from it, or tap the icon again and it will close. Or if you tap on a file that is shown, the file and app will open of course. This basic functionality is the same on most iOS devices, applying to all iPad with the Files app, and all iPhone models without 3D Touch. With 3D Touch iPhone models, the approach is slightly different. On iPhone models with 3D Touch or haptic feedback, use a firm press on the Files app icon to see the recent files list instead. Everything else is otherwise the same. If you tap and hold without 3D Touch on the iPhone with 3D Touch, then you end up with the shaking icons that allows you to delete apps on the 3D Touch iPhone models. 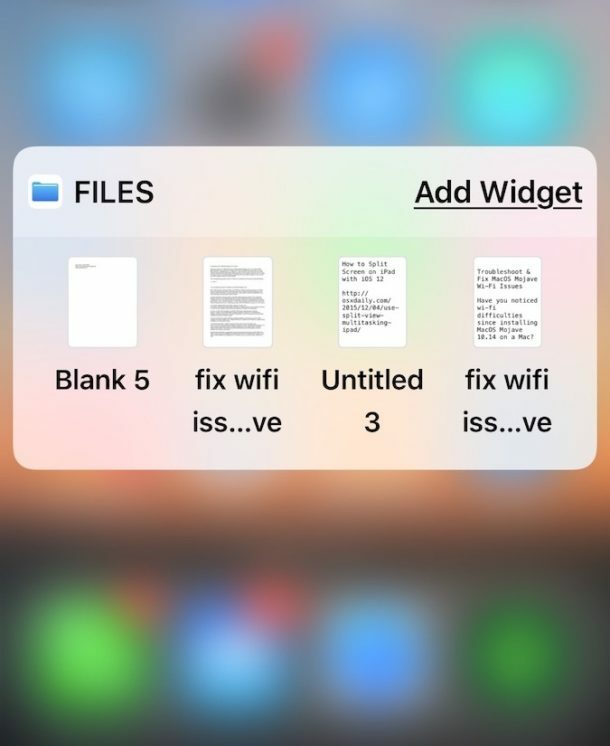 The Files app in iOS offers a file system of sorts for iPhone and iPad users, and though it’s much more limited than Finder on the Mac, it still offers many common file system functionalities, like the ability to rename files, sort files, tag files, create new folders for your files, and more. By the way, Mac users have many different ways to access recent files too, including the “Recents” Finder item (used to be called All My Files), the Recent Items submenus of the  Apple menu and Recents menus, optional Dock stacks, two-finger double tap on Dock icons, amongst many other methods. One of the things that forces me to use something other than an iPad is that I can’t figure out anyway to rename the files. That turns out to be a critical step in one chore that I do. Am I missing something? Or is it just impossible? Yes, it’s fairly easy. In the Files app, tap and hold on the document icon, then click rename. But I can only see a tiny number of photos using Files. I have over 6K in the Photos area. I cannot see them from Files. That’s the standard behavior of the very restrictive iOS. It doesn’t allow direct access to your photos through the files app. If you want to see any of your photos in the files app, you will have to first save a copy of them in there from the photos app. Why did my previous comment disappear? Many comments get flagged by our aggressive spam filtering for various reasons, unfortunately some comments get erroneously flagged like yours was – even my response to your comment was flagged for example! Sorry about that! Just have some patience next time. This site often sends comments to moderation for no apparent reason, but unlike other tech forums the comments do end up appearing a bit later. I’ve had that experience here lots of times (it happens almost every time I post). On my iphone SE (which has not got 3D touch), holding the Files icon just makes it shake ready for deletion. What should I do to access recent files in Files? You are correct, I just tried it on another iphone without touch id. Apparently the recent files feature is only available on 3D touch equipped iphones and all iPads, but not on older iphones that don’t have touch id or when touch id is turned off. Looks like the article did make a mistake in that sense. I’m worried about increasing reliance on Touch ID. Many years ago I applied for a job requiring fingerprints. I couldn’t make it work on my previous iPad so I didn’t even set it up on my new one. It’s already forcing me to enter more fields by hand but what am I supposed to do? Don’t worry about Touch ID. Next time you upgrade, you’ll be getting Face ID instead so your fingerprint problem will be gone. And for now, you could still rely on just the passcode. It’s necessary even when Touch ID works ok because Touch ID is disabled every so often and required the code to reenable it. BTW on my first post, I meant to say I had tested the recent files feature on an iPhone without 3D Touch, not Touch ID, and it did not work. Sorry about that. Useful information, thanks. Is there any way to clear the recent files list on the iPad either temporarily or permanently? I often want to show somebody a document on my iPad. I’m concerned that the excellently detailed previews could reveal confidential information which that person should not see. I have an iPhone SE running the most current version of iOS and have no such “Files app icon as seen on the iOS Home Screen or Doc”. Where is this located? I think it comes standard on all iPhone but maybe it was deleted or not downloaded? 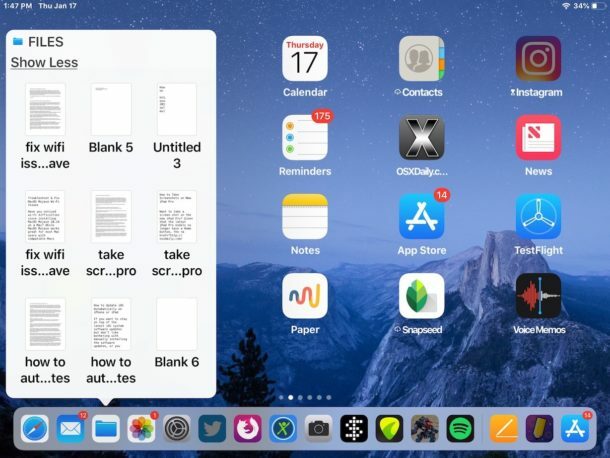 Files.app for me is on my main home screen but I have seen it on second and third screens too, so it therefore is where ever you put it on the home screen of your iPhone. 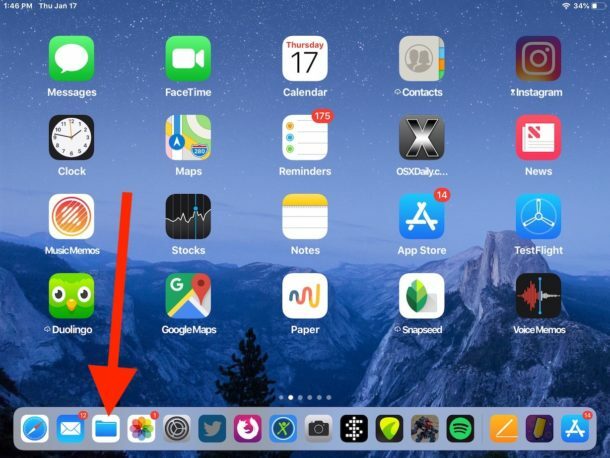 Use the Search for it if you can not find the icon, if you don’t have it you can install it from App Store from Search too. I am not sure if the naming convention makes sense though, calling an app Files is sort of confusing, are your files in Files or are your files in the app? What files app? What app files? Feels like Abbot and Costello Who’s on first skit? You know what I mean? Files.app needs more features, like local storage. It also doesn’t wrap up all files interacted with on iOS so it’s not consistent enough to use as a file system, some apps don’t use it at all it seems? 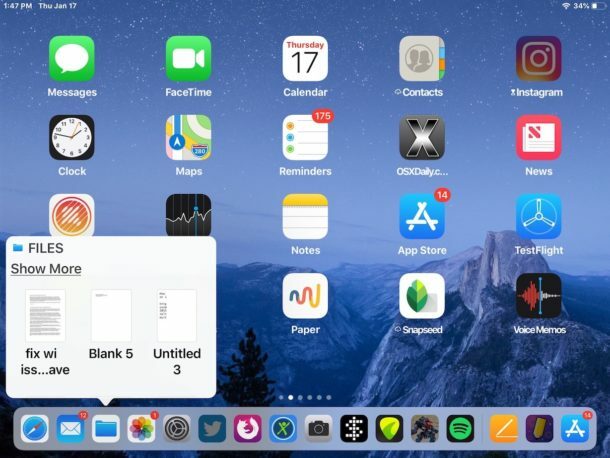 There is an error in this article: at the end of the first part it states that “This basic functionality [seeing recent files] is the same on most iOS devices, applying to all iPad with the Files app, and all iPhone models without 3D Touch.” This is incorrect. The recent files functionality only works without 3D touch on iPad. On older iPhone models without 3D touch or any newer iphone with 3D touch turned off for any reason, the recent files feature for the iOS files app IS NOT SUPPORTED. up from down to up!